“The Caliphate is wound around the premise that an ISIS-like conquest of the United States has been successful. One might think ‘Yeah, like that would ever happen,’ until Erishkigal constructs her disturbingly plausible backdrop for the novel to follow. Eisa McCarthy is a faithful Muslim, one who refuses to set aside her humanity in the name of doctrine. We see the story through her eyes as she navigates her difficult path. Burdened by memories of a father now besmirched by propagandized history into the image of a traitor, she finds herself propelled by her circumstances into a fold of resistance marking America’s last efforts at redemption. 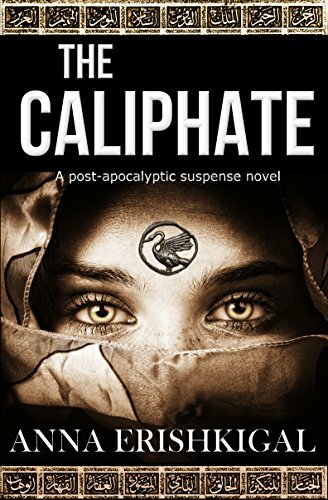 The parallels the author draws between the current landscape in Syria and Iraq and a future United States are unsettling, as they portray present-day atrocities with unflinching accuracy. The dominion of evil Eisa opposes is factual, departing only in scope from conditions experienced already inside less fortunate borders. Likewise, the courage of female fighters against a misogynistic foe is drawn from our world and extended into the author’s adroit, fictional presentation. One is left with the conclusion that, yes, this could happen here. If it does, we will have the same choices Eisa, her compatriots, and fellow victims of dominant, Islamist fundamentalism do: resist for the sake of those who can or will not, or hope for the best at the sparse mercy of conscienceless oppressors. That was the easy part. Dealing with the threads of actuality the author pulled together into to this work came next, all part of the era our world will attempt to resolve into the foreseeable future. One of her themes is the nature of absolutism, in particular Islamofascism of the type now plaguing portions of Iraq and Syria. Fundamentalist Muhammadanism continues to export its proponents into every corner of the globe via the infrastructure of a world growing smaller by the year. As in Anna’s backstory, misplaced guilt and sympathy provided the inroad for a substantial population of assets who intended to fulfill the vision of their Prophet: to conquer each piece of land on which they place their foot. Here stateside, we only days ago decided a presidential election. One of the major candidates for years had been advised by a staffer connected to the transnational, Sunni Islamist ‘Muslim Brotherhood.’ Huma Abedin fulfilled for Hillary Clinton a role similar to Valerie Jarrett, a current Senior Advisor to the President and of Iranian birth who principally influences his foreign policy. Had the electoral process gone another way, through the fruition of policies enabling Muslim influx we might have been well on the way toward the same type of soft cultural jihad currently being suffered by Europe. Anna extended the premise into a plausible scenario, in which the movement eventually gains control of America’s nuclear arsenal. Afterward the regime holds the threat of annihilation over not only America but the remainder of the civilized world. There she hits another thread weaving itself through human history. There are two types of us, you see. The first and perhaps the larger contingent would rather give in than get hurt. Those hope for the best, that their predators in life will pass them by, and that they will be allowed to continue what is an essentially undeserved existence. For the bright spirits, the heroes amongst us such as Anna’s protagonist Eisa McCarthy, the opposite philosophy takes hold. From somewhere within, the Spirit finds a foothold, and one finds the reverse to be true. Courage follows, and one threads a path though fear forward to decisive action. Conflict is tiresome, and those who seek to dominate their fellows know this. Domineering personalities therefore promote division at every level possible, so their policies might eventually flourish through a lack of resistance. Fear likewise is a circumstance the undeveloped soul seeks to avoid. Violence and its terrifying aftermath, of course, is the most effective cowing agent of all. So it is under the rule of ISIS within the bounds of its miserable territory today. It is well to remember the laws of human nature are as much in effect in this country as they are in the Near East. We enshrine and protect freedom of religion in our Constitution. Such recognition resulted to ensure the freedom from oppression for the devout and conscientious. Islam of the modernistic, reformed variety—the sort content to reside in the front half of the Qur’an as encountered in the Balkans—seeks only to worship the God of Abraham after the prompting of the Spirit as do their brother Jews and Christians. Such folk choose love over hate and indifference, and bother no one as a result. Islam metastasized is an altogether different entity. There, civilized harmony is antithetical to the later verses of Muhammadan scripture they embrace, in which adherents are instructed to accept the latter of contradictory guidance. Those are the chapters, which encourage terror and subjugation, making the global war between twenty-first and seventh-century philosophies what it is. Such can no longer be tolerated under the banner of ‘freedom of religion.’ As the social media meme points out, if your religion requires you to kill me to get to heaven, I don’t need to tolerate that. Assigning constitutional protection to the polar opposite of Americanism and an ideology of conquest is beyond foolish; it is self-destructive. Islam, particularly in Wahhabism, cannot be considered only another quaint religious tradition safe for the imagined secular humanist to dismiss and ignore. It engenders, as Winston Churchill observed, a distinct fanaticism as dangerous in a man as hydrophobia in a dog. Past a certain point, the two afflictions have only a singular and identical course of effective treatment. Anna Erishkigal’s characters, particularly her women, you may rest assured become masters of addressing this condition in their enemies. We might contend with Eisa McCarthy’s premise that “Allah has no sons, only daughters,” but in the end we cheer the courage that is her byproduct of faith. These contests, as they have throughout history, retain a significance beyond the contexts of their actors. There are lessons there, unseen if unsought, God-placed for those who will. This entry was posted in Uncategorized and tagged action, adventure, Anna Erishkigal, fiction, ISIS, Islam, refugee policy, suspense. Bookmark the permalink. In the last analysis, everyone is, Anna. It’s the willing instruments who will be honored. Best wishes for the title!